A: It’s hard to say, exactly. I started writing with the shipwreck scene – I was thinking about refugees over the centuries, displaced by war and religious upheaval. Then I was thinking about the way in which people discuss, sometimes fearfully, the explosion in information in the world right now, and the parallels to the centuries after the printing press was developed in Europe, and the role printing played in the Reformation and CounterReformation. Somewhere out of that came the core of the book. 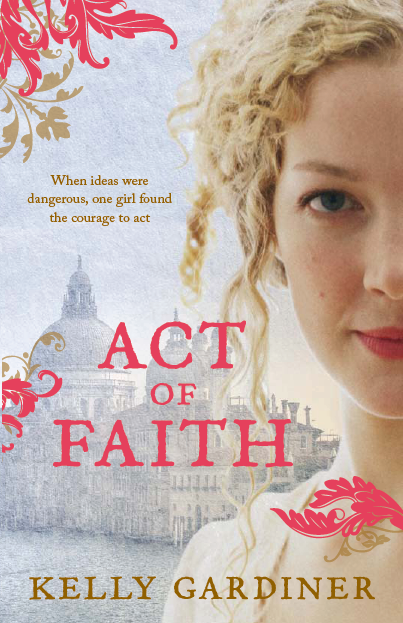 A: For Act of Faith I spent nearly as much time doing the historical research as I did drafting. There are a million things I needed to know about the time and places in which the book is set, and even though I chose a period with which I was vaguely familiar, I also need to check all my assumptions and memories of what happened when. Most of the work is just to make sure you don’t write anything wrong – simple things, like the fact that people didn’t normally say “hello” or shake hands, as a greeting. In fact, one thing I learned was that it was the Puritans who introduced shaking hands in England, as a sign of equality, and everyone else thought it quite hilarious. A: None of them are based on anyone in particular, but Isabella is a reminder to us that there were women in the 17th century (and before) who were well-educated and talented, and also that there were many who worked for a living. Master de Aquila is based on a whole generation of Spanish and Portuguese printers who fled persecution and headed for Amsterdam, Venice and elsewhere. Al-Qasim is emblematic, too, of the great thinkers and scientists of Arabic and Ottoman scholarship of the time who also faced persecution in Europe. The other characters are entirely fictional. Q: Did anyone ever escape from the Inquisition? A: A few people did escape from the dungeons or in transit, but I don’t think anyone escaped quite so publicly – and frankly, I don’t think anyone would have. But when I was researching the autos de fe, I read that the guards were rarely armed, because the main weapons used were awe, fear and faith. And that made me wonder: what would happen if you called their bluff? A: I’m very fond of Isabella but I must confess that the character I see most clearly in my mind is Signora Contarini. Q: Why isn’t there more romance in it? Thanks for your message – so glad you enjoyed the book!